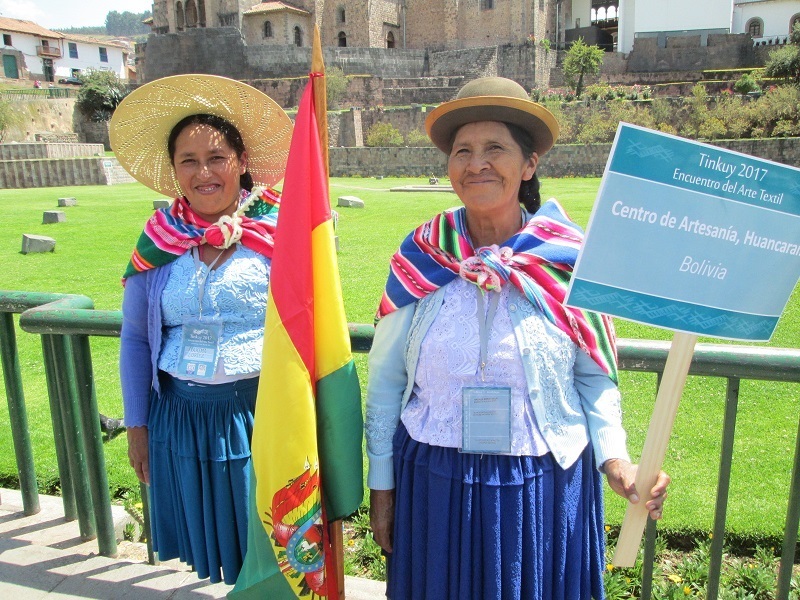 Congratulations to Nilda Callañaupa, the Tinkuy International Weaving Conference Organizing Committee, the Centro de Textiles Tradicionales de Cusco (CTTC) weavers, and all the Tinkuy volunteers for creating an incredible 4 day textile extravaganza. All 5 senses reeled under the color, movement, texture, and sounds of Tinkuy 2017. Wow! It is still impossible to summarize coherently but references to the Tinkuy will be ongoing because there was so much information relevant to PAZA´s activities and idea possibilities for the future. 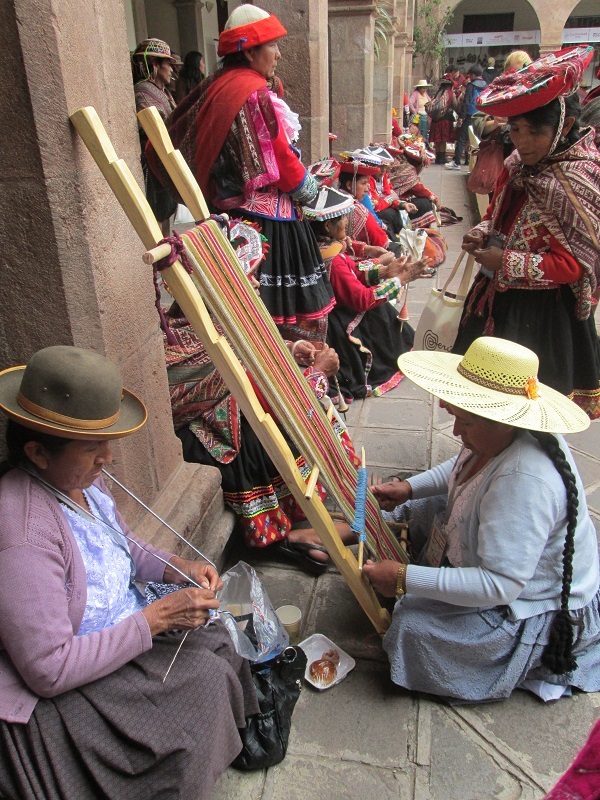 but there are probably only a handful in all of Cusco who could translate Quechua to English. The 5 months of research to put together the presentation led to some intriguing questions that will be fun to investigate and report on in future blogs. 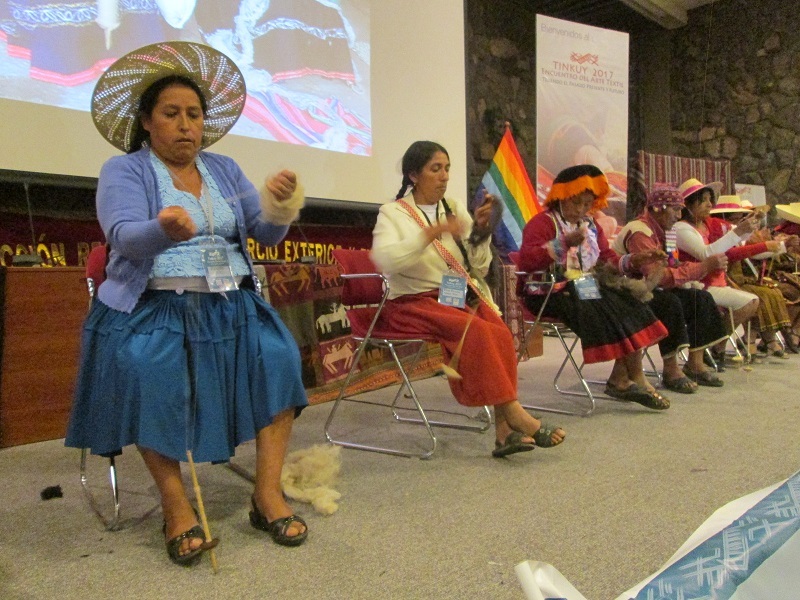 The women spoke in Quechua which was understood by the majority of the audience who were the hosting Quechua speaking CTTC weavers. It was a thoughtful way to end the 4 days of presentations. accompanied her. 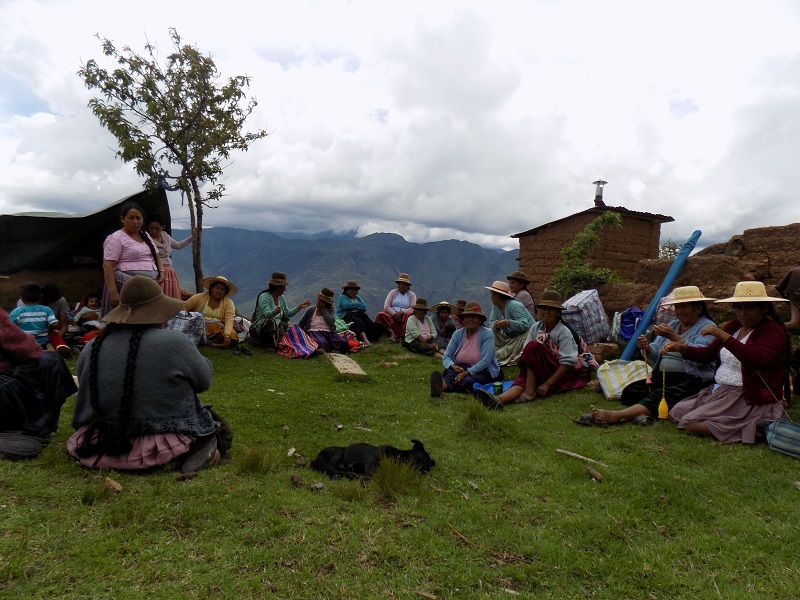 Prior to this trip Doña Justina who turned 60 this year had never been anywhere that wasn´t to visit family and on those trips she was always accompanied by family. 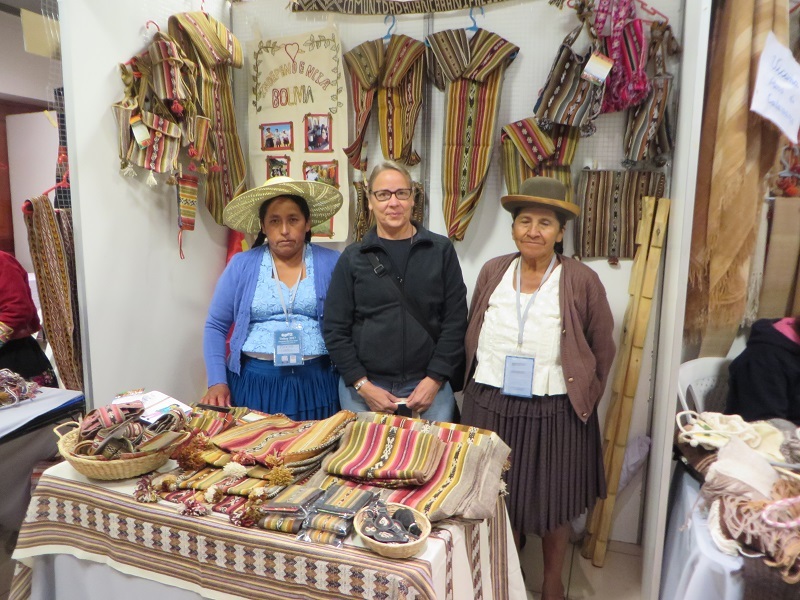 The weavers met Karen Sprenger who lives near Dorinda´s parents in Kansas and has promoted the weavings in the local fiber community. As Doña Máxima chatted with Deborah Chandler in Spanish she was unaware that Deborah is the go-to person for advice when PAZA hits a snag in the road. There have been many comments about Doña Máxima´s unsmiling countenance. It is cultural. For years she has been able to look through the PAZA photos to select those of herself and her family for developing. She never selects photos where she is smiling, she says they are ugly. Karen Sprenger with the Weavers. All Weavings are in Kansas and are Available to Buy. Dorinda has gifted many “happy face” photos to Doña Máxima who graciously accepts them, but who knows what she does with them when she gets home. 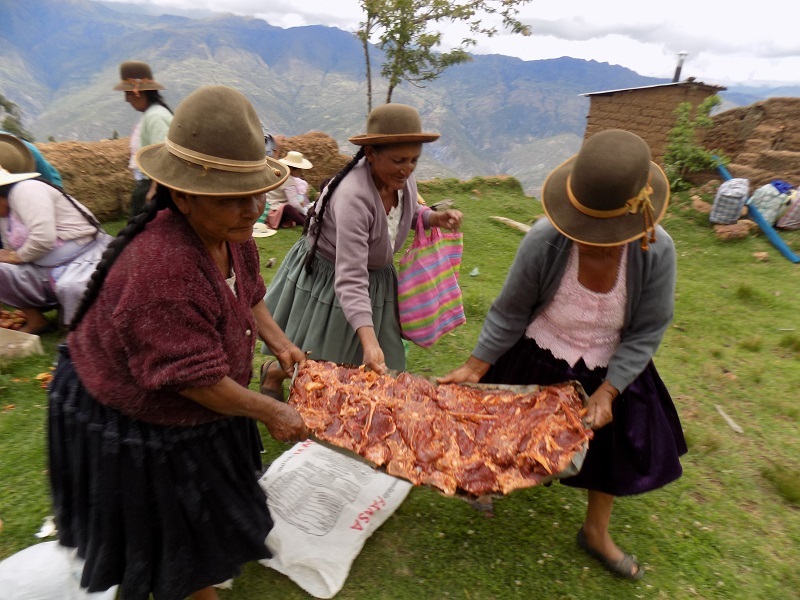 The expression that should have been captured on film was Doña Maxima´s beatific smile when she walked off of the airplane in Cochabamba into the arms of her daughter, son, and 2 granddaughters. The smiles and tears of joy and relief on the faces of Doña Máxima´s family and Doña Justina´s 2 daughters and grandson would have made you cry. They were so happy and relieved to have their mothers safely home. 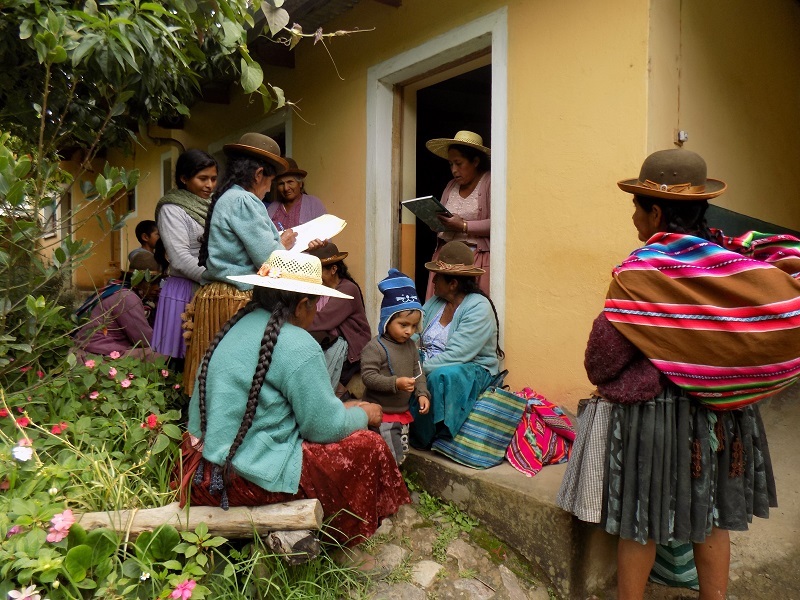 The inventory of weavings in the U.S. is building up, and that slows down PAZA´s rotating fund for placing and purchasing orders with the weavers. ‘Tis the season… Weaving a yoga mat strap is where a beginning weaver starts weaving to earn income, although all the weavers weave them. 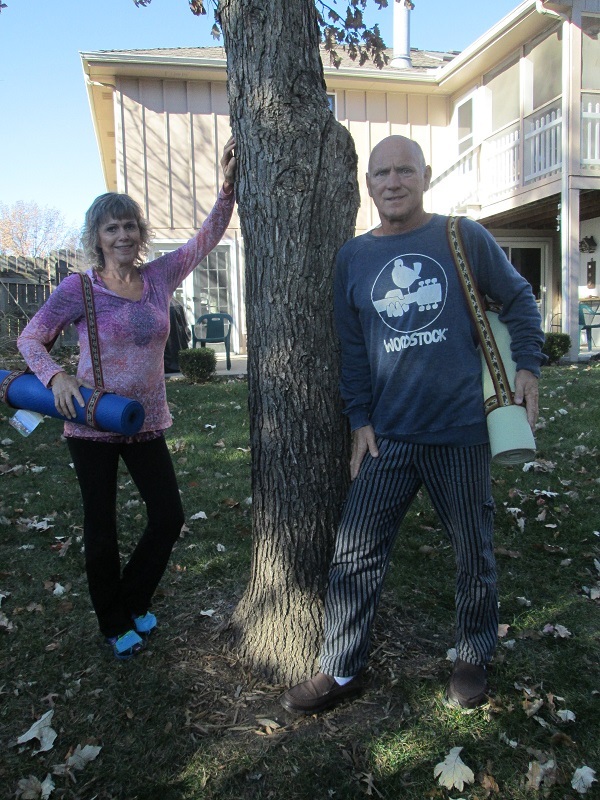 If there is a yogi on your holiday shopping list the yoga mat straps for a 1/8” thick sticky mat are $21 and for the ¼” thick exercise mat the price is $22. 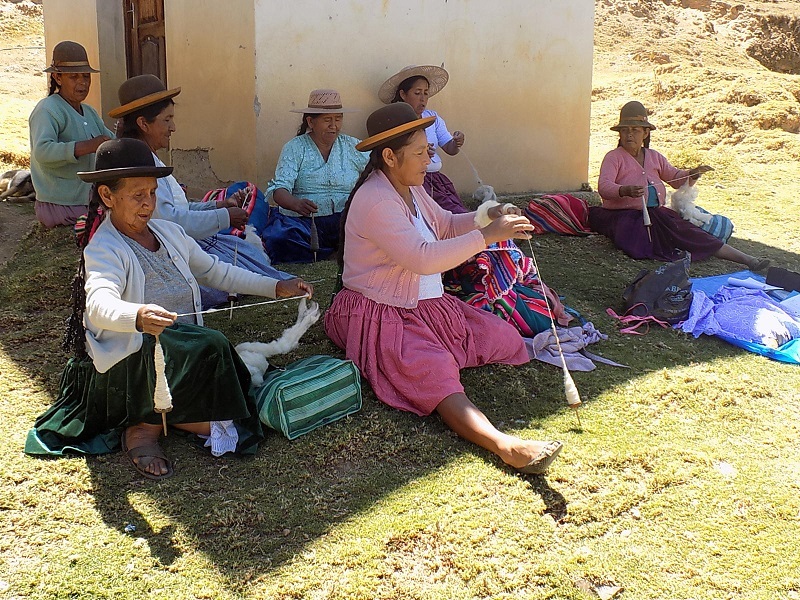 Is there a weaver on your gift giving list who would delight in hand spun, natural dyed cloth with Andean motifs to use for her own projects? 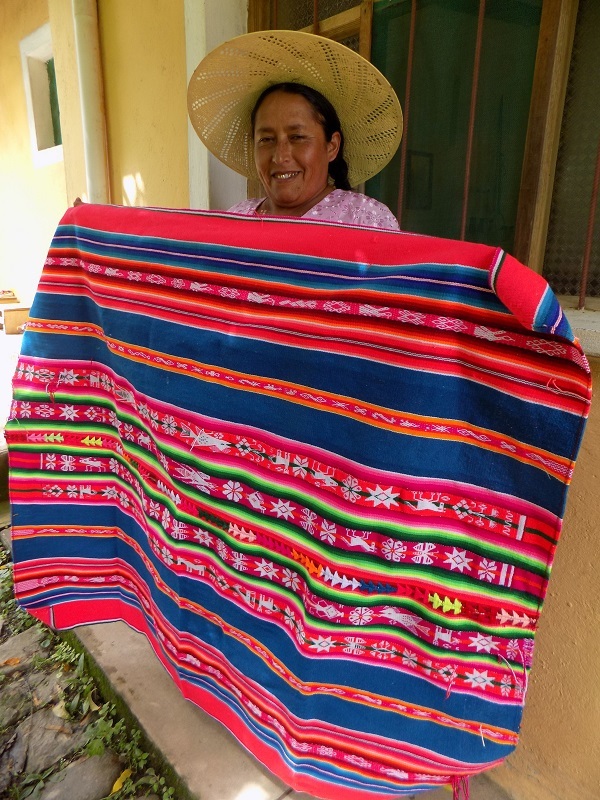 The fajas are bands of cloth 67” x 4.5” and cost $35, larger weavings PAZA uses for making the zippered pouches are 63” x 9.5” and are $64. The 75” x 1.5” straps are $19. The lined zippered pouches are $15 and $16 with a wrist strap. There are dress/tunic sashes measuring 60” x 2.5” for $35. Also available are chuspas in a variety of sizes and priced accordingly. All the weavings have a story, and that´s what makes them such special gifts. Orders will be accepted until December 14th, with the last shipping date on December 15th. Contact Dorinda at dkdutcher@hotmail.com. Since 2014, the Wednesday of Spinzilla Spinning Week is spent taking photos in Huancarani and checking in with the majority of the Cloth Roads team Warmis Phuskadoras who live in that rural community. Each year it is more fun, probably because the spinners have come to realize that Spinning Week offers social opportunities just for them without added responsibilities or work. 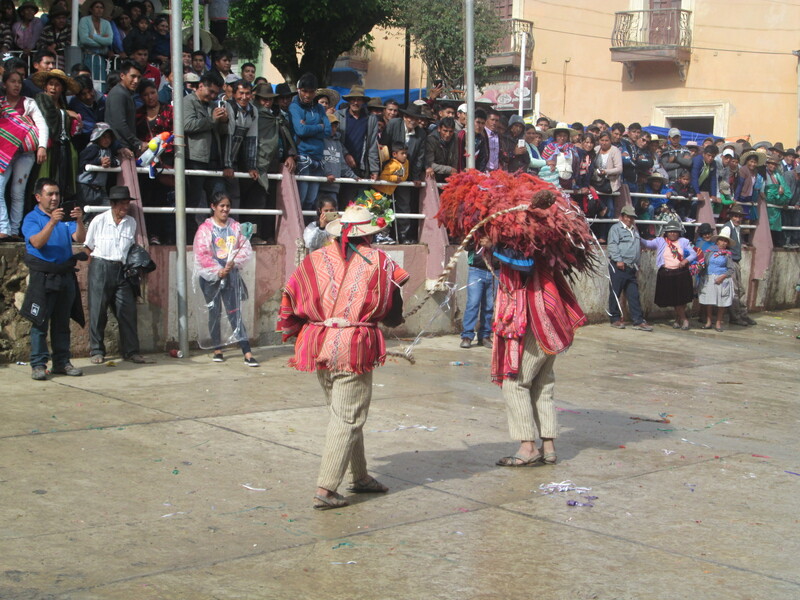 Fiestas and civic day celebrations involve cooking for a big crowd and then cleaning up. A small pickup truck was contracted and driven by Don Julio, Doña Máxima´s husband. Besides driving he provided the community service of collecting signatures for paperwork that will be submitted to the national government for disaster relief from crop damage due to hail and wind last March. 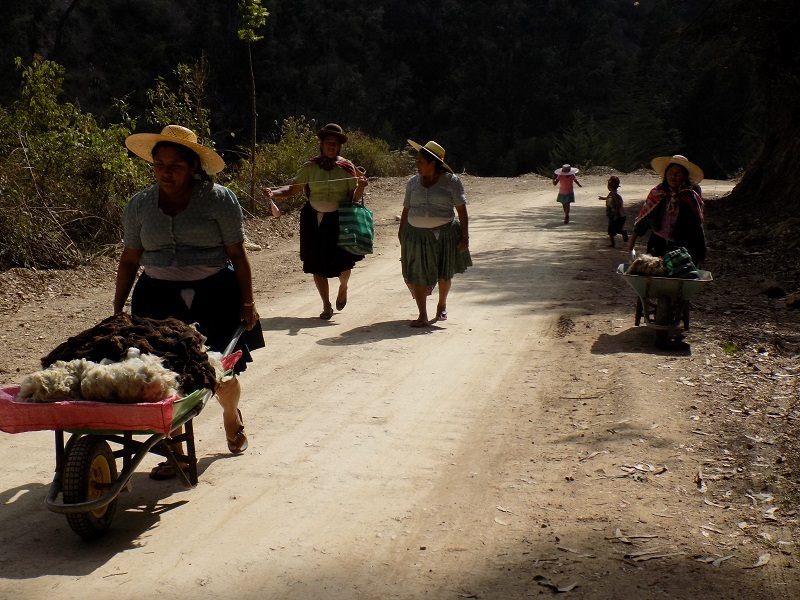 Doña Justina was waiting by the turn onto the new “road” leading to the north side of the community. Somehow she managed to effortlessly spin with her phuska (drop spindle) packed into the backseat with Vilma, Dorinda, bags, and stuffed aguayos. Don Julio parked on a grassy flat that offered a spectacular mountain view. Spinners were spotted walking and spinning from 4 different directions, except for Doña Julia who carried her phuska in one hand and a bowl of potatoes, eggs, noodles, and lettuce to offer the visitors. The spinners spun, and some of their husbands arrived to meet with Don Julio. 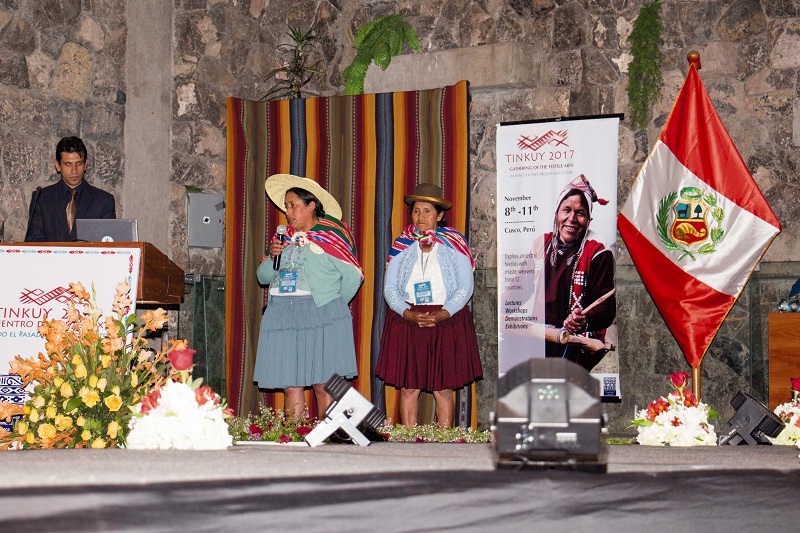 Doña Andrea, who is competing for the first time since 2014, is the mother-in-law of Maribel, the youngest Huancarani weaver. Maribel is waitlisted for Spinning Week so although her name was not submitted to Spinzilla she is competing for the first time as a team member locally. Doña Andrea is Don Julio´s sister and she invited the visitors to their home a few steps away. It is rare that an opportunity arises to visit one of the rural farmsteads. 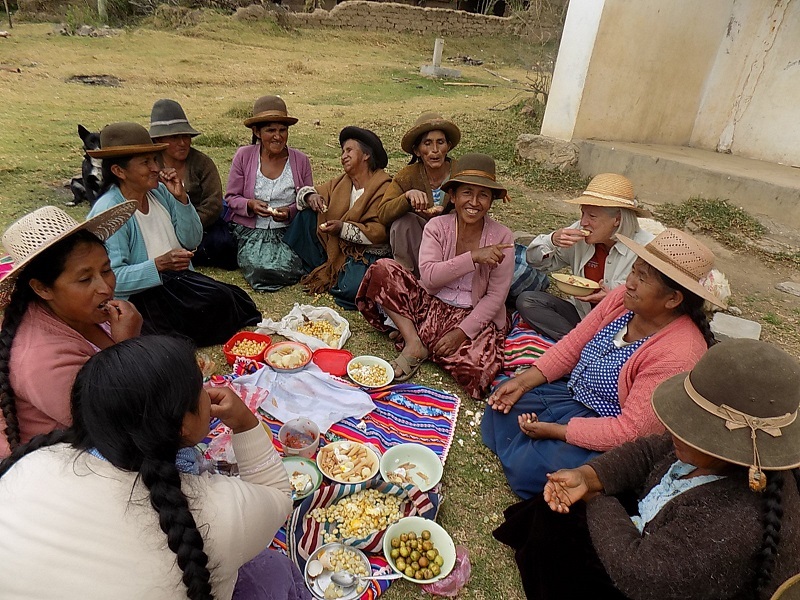 The visitors were treated to a bowl of la cayote, a huge squash, that is normally undercooked and lacking in flavor. Doña Andrea had simmered the squash over a low fire all day the day before releasing the sugar which gave it a sweet delicate flavor with a hint of cinnamon. Yum! 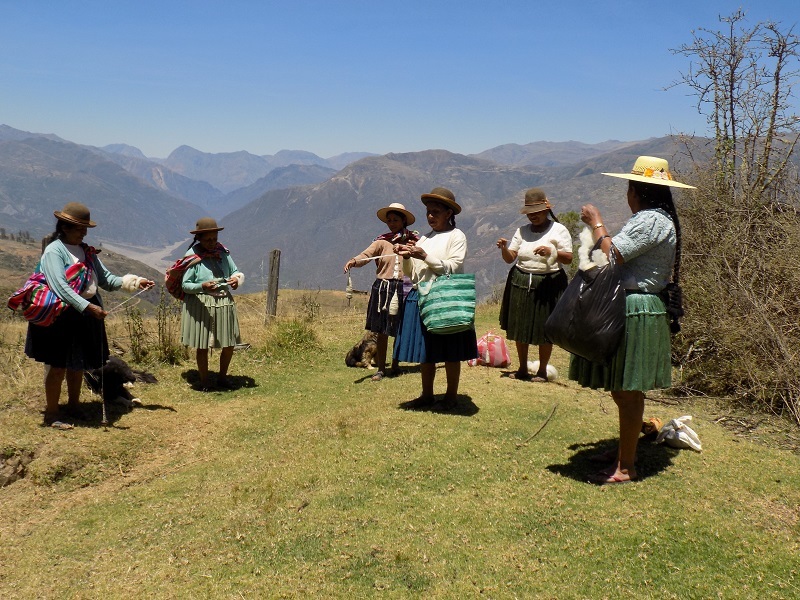 The visitors headed back to the main Huancarani road and stopped half a mile above the community center of school, church, soccer field, and an irregularly staffed health post. 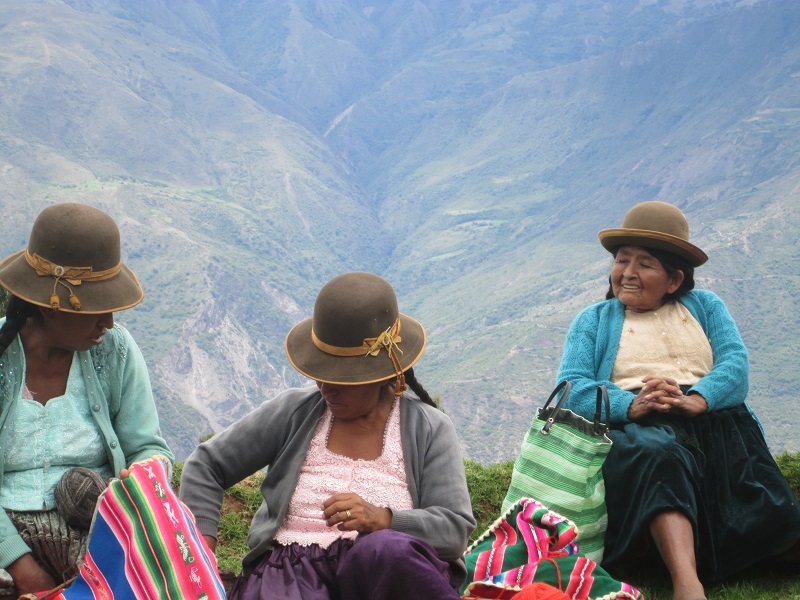 Doña Ines with her youngest, Doña Casimira, and Doña Verna were sitting in a picturesque field chatting and spinning. 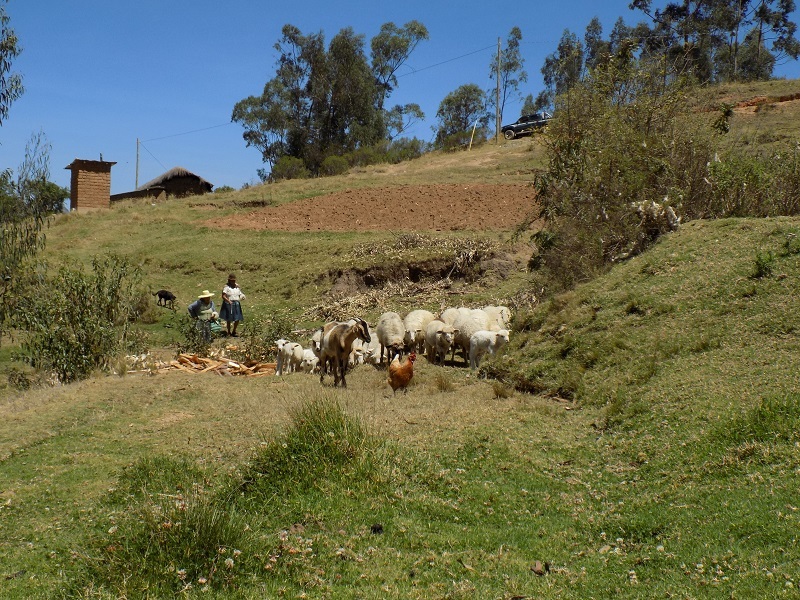 As soon as the visitors made their way to the group Doña Toribia and Doña Eulogia came up behind them herding Doña Toribia´s mixed flock of goats and sheep. 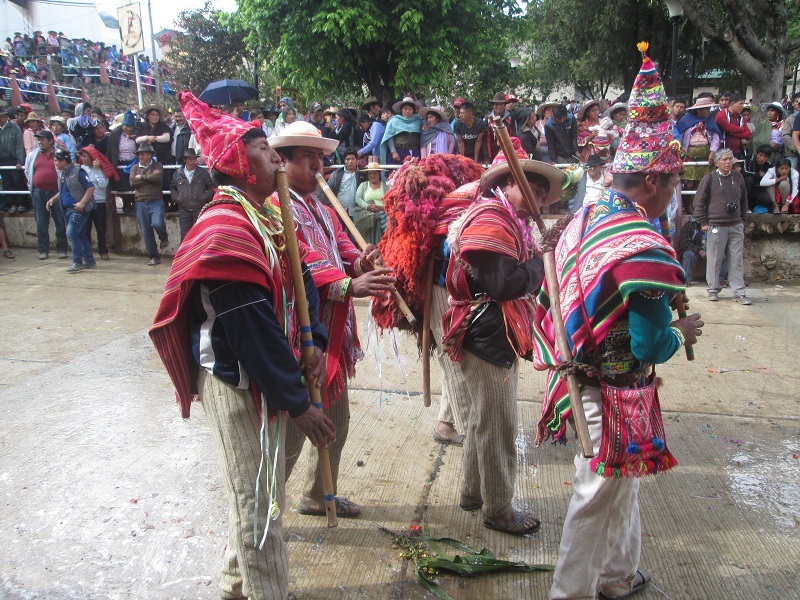 The odd thing was that a plump red hen of Doña Eulogia´s was leading the parade apparently unconcerned about the large mammals following close behind. Doña Eulogia´s daughter Doña Cirila arrived, she recently returned to Huancarani after years in the city and is competing for the first time. Don Julio took over keeping the flock from scattering so the women could chat and spin. Where is the 3rd Group? jokes that kept all laughing. Doña Dionicia arrived with 2 plates of food to share with the visitors, which was the signal for all to plop to the ground, put down their phuskas, take the aguayos off their backs, and pull out plates of boiled corn and cheese or boiled potatoes, noodles, and fried egg for a communal lunch. The visitors had brought soft drinks, juice, and water that were served at each stop and much appreciated on this hot sunny day. 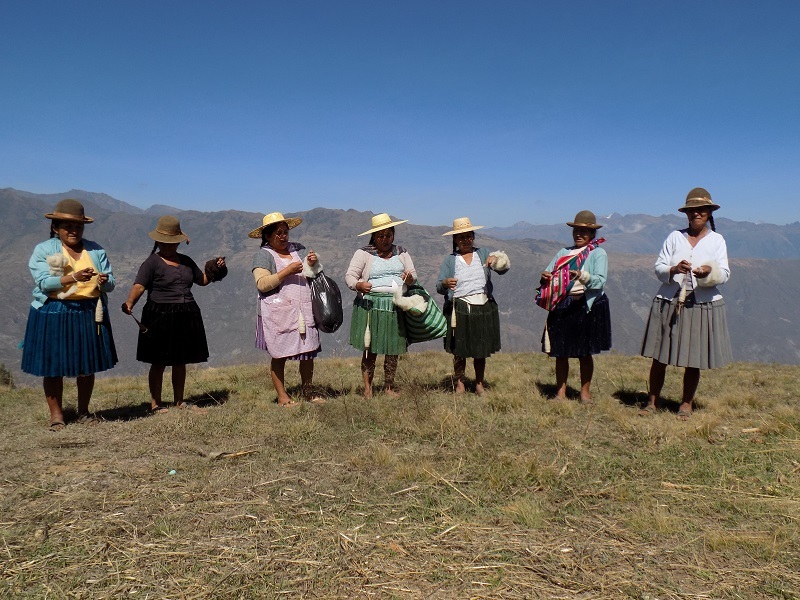 Last to arrive were Doña Antonia Calcina and Doña Julia with their flocks of sheep. Doña Julia is spinning on the waitlist this year because she couldn´t decide whether she had the energy to compete or not. They spun with the group and chatted for a bit then headed further afield with their flocks. It was a perfect day! Spinzilla is more fun every year while offering learning and problem solving experiences for the women as individuals and as a group. A one-time experience would not be enough to make any impact on their lives, so with that in mind thank you to those who have supported the team and PAZA for multiple years! Thank you Kris Fister, Dorothy Thursby, Patty Tompkins, Margaret Tyler, and Linda Switzer for your continued support! We have reached our goal to meet the Spinzilla expenses. 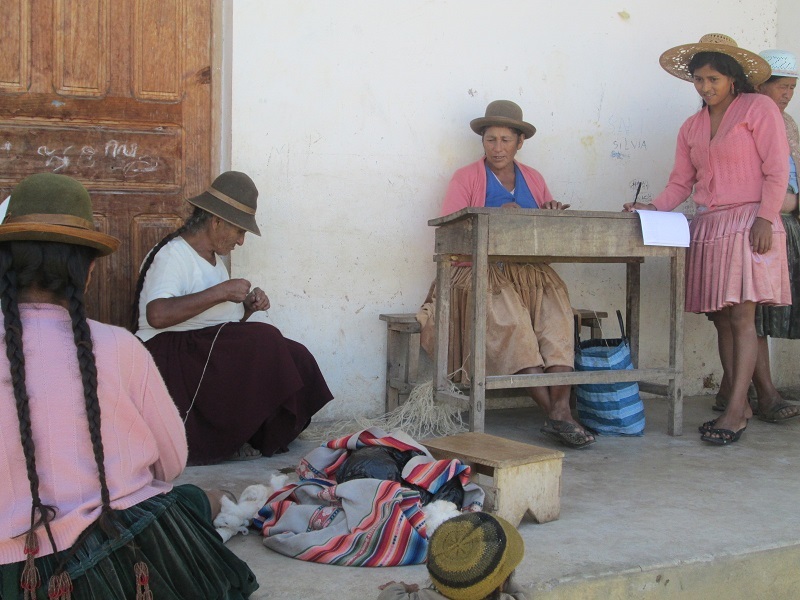 September was a month of preparation for Spinzilla Spinning Week and for November’s Tinkuy International Weaving conference in Cusco, Peru. 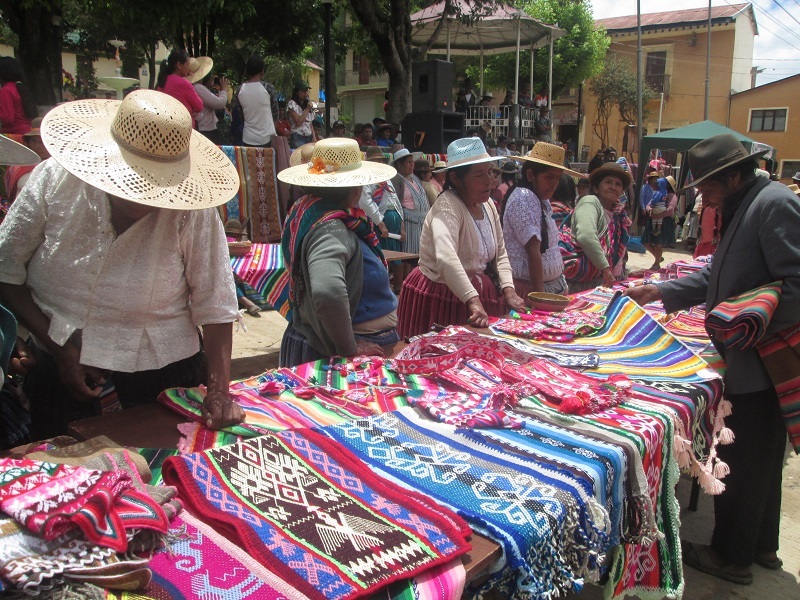 Doña Máxima made a trip to Cochabamba to order the banner for the Centro de Artesanía, Huancarani (CAH) that will debut at the Tinkuy’s Inauguration parade. She and her daughter Zoraida also shopped for 2 shawl samples so that the Spinzilla participants will have some choice in this year´s “All Win 1st Prize”. They learned that the shawl vendors will have little or no inventory until next June when winter rolls around again. Spinzilla always offers a number of problem solving opportunities for the team, and one solution is to buy material and have the Club de Artesanas (CdA) members crochet the borders and add the fringe for a per shawl wage. Two days later the Club women fired up the dye pot and the molle leaves simmered scenting the air with a heavenly fragrance. The yellow resulting from the 1st dye bath met expectations but the possibility of a 2nd dye bath looked grim. Doña Antonia saved the day by offering to return from lunch with some dried turmeric root. 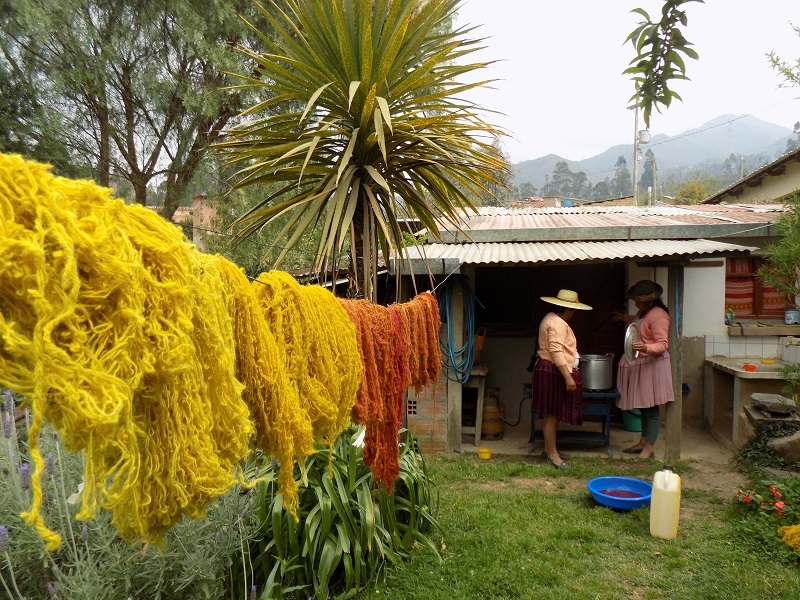 A relative living in a tropical area of Bolivia had gifted fresh roots to her and she had dried them after the Club used them for numerous dye pots in 2013. The simmering turmeric added its exotic spicy scent to the air and the resulting color was a burnished golden yellow. For a 3rd bath a bit of cochineal was added and the results were a burnt orange. Dyeing continued over 3 more days due to the need to spin more yarn to dye. Glorious vivid reds and red oranges emerged from dye baths 4 through 8 with the addition of a few more grams of cochineal, cream of tartar, alum and citric acid. In 10 years of dyeing such a magical dye pot has never before been experienced, appreciated, and so enjoyed. The rains that washed the molle leaves also flushed the river which had almost slowed to a stagnation. Fleece and sheepskins were scoured at home in hot water. 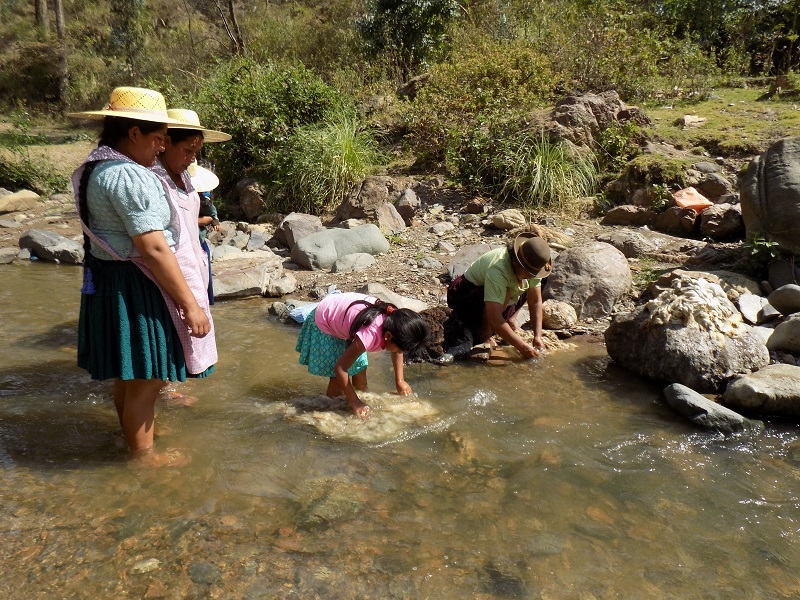 After lunch following the molle excursion the Club members headed to the river. 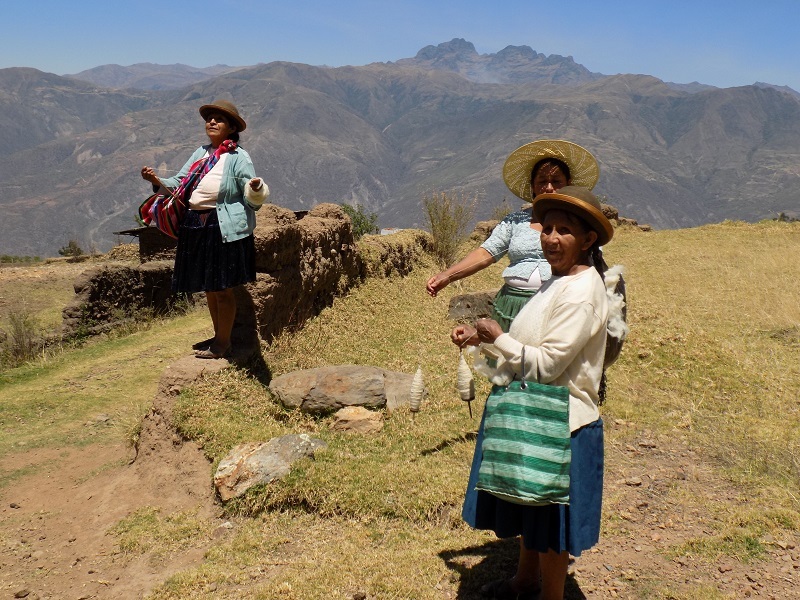 Doña Maxima and Vilma took turns pushing their wheelbarrow that held 2 sheepskins, a black fleece, and a gray fleece. 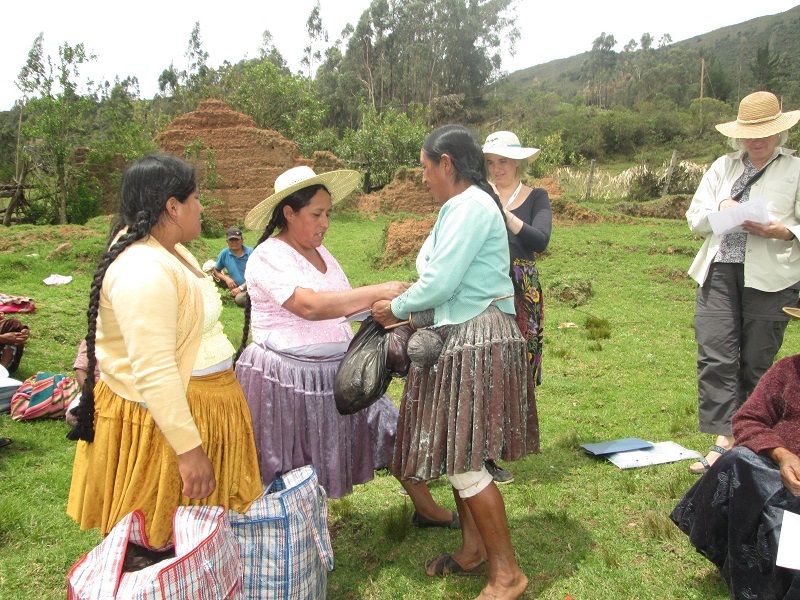 Doña Antonia was carrying white fleece in a bag of woven plastic in her aguayo on her back. 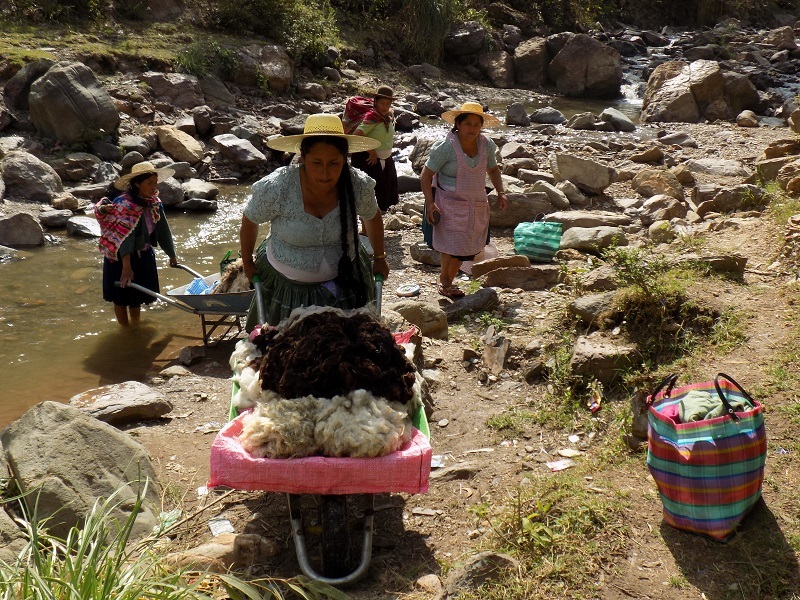 Doña Rufina had a mixed black and white sheepskin and some laundry in her wheelbarrow. With some effort the wheelbarrows were rolled to a pool above the ford where teen boys were lovingly washing their motor scooters. 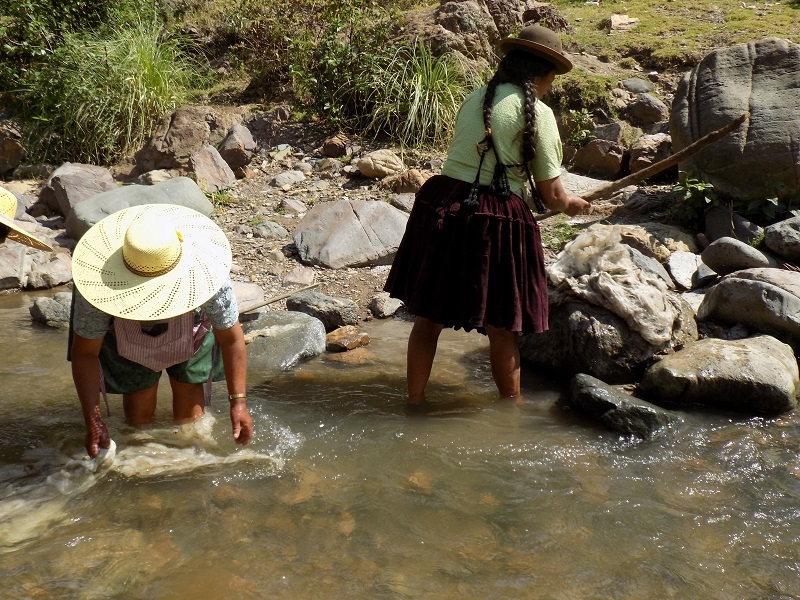 Doña Antonia wet the fleece she´d brought and then laid it over a large boulder and pounded it with a stick. 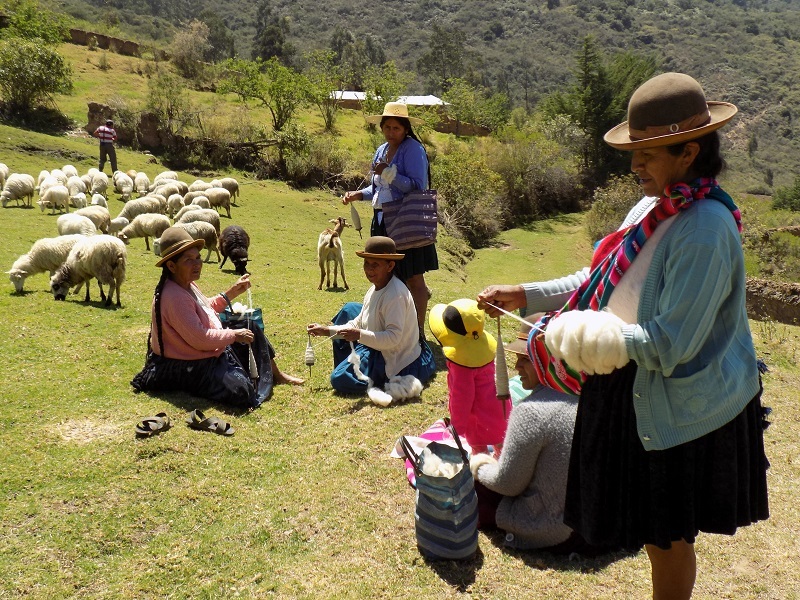 Doña Máxima, Vilma, and her 8 year old daughter Emily submerged their sheep skins and fleece one at a time to work through them with their hands to remove debris. The rinsed fleece and sheepskins were draped to dry over sun warmed boulders. 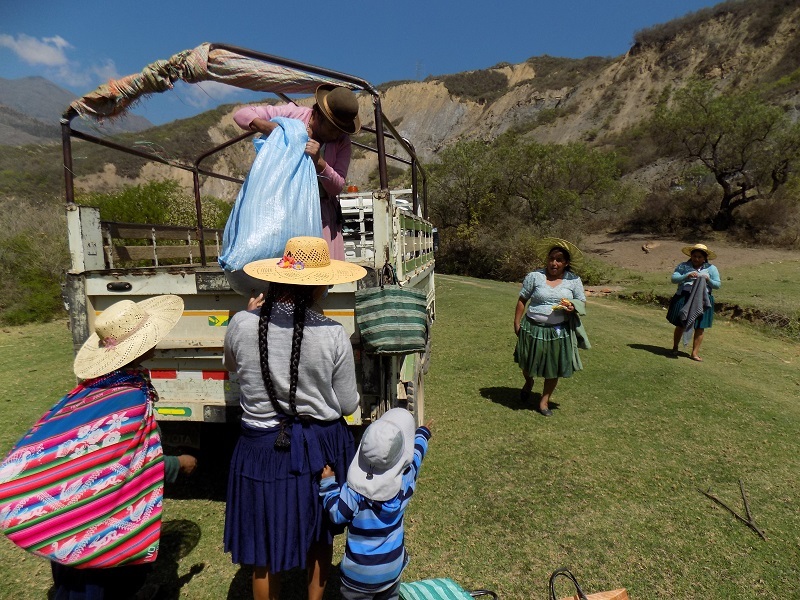 Wheelbarrows were washed out, loaded up, and with a sense of accomplishment the group headed merrily homeward. The following week, and last week prior to Spinzilla Spinning Week, the Club members began preparing coils of roving. 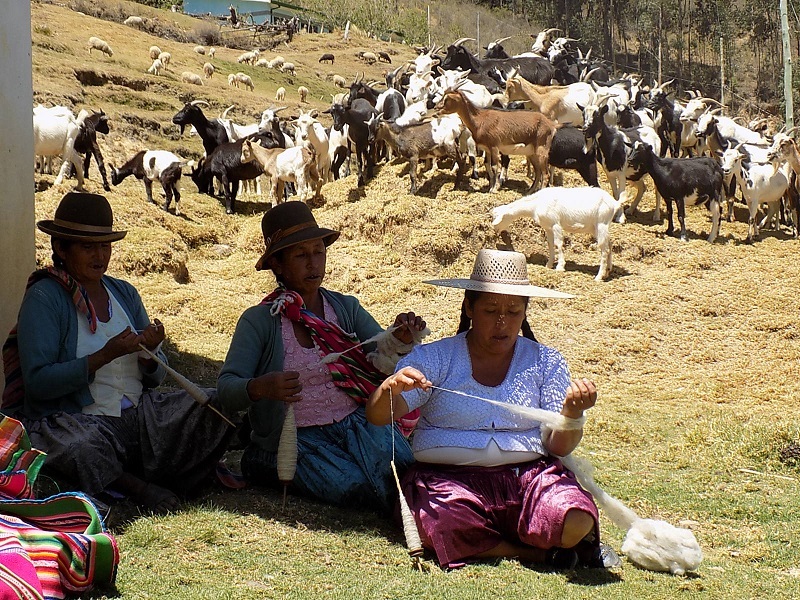 Doña Antonia watched Doña Máxima shearing fleece off a sheepskin and decided she was unhappy with the fleece that she had washed. 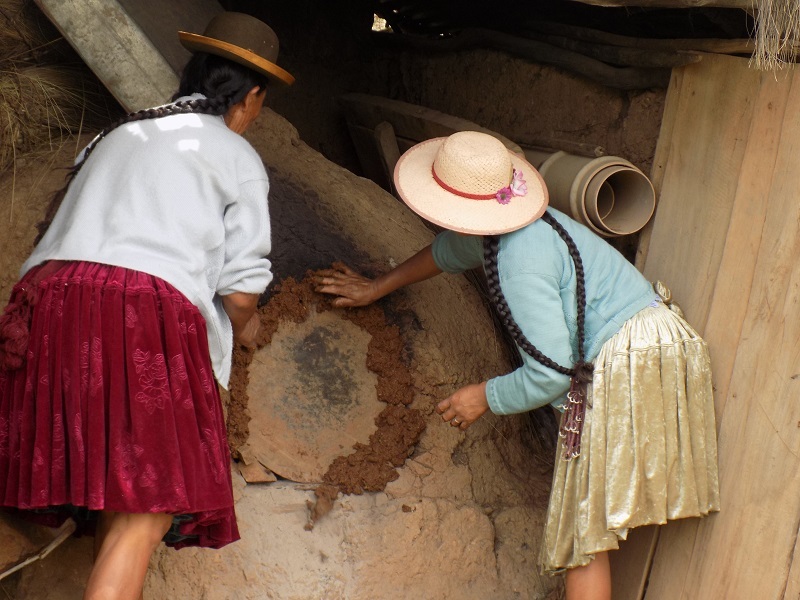 It had dried hard instead of drying soft like the fleece Doña Máxima was cutting away from the sheepskin. 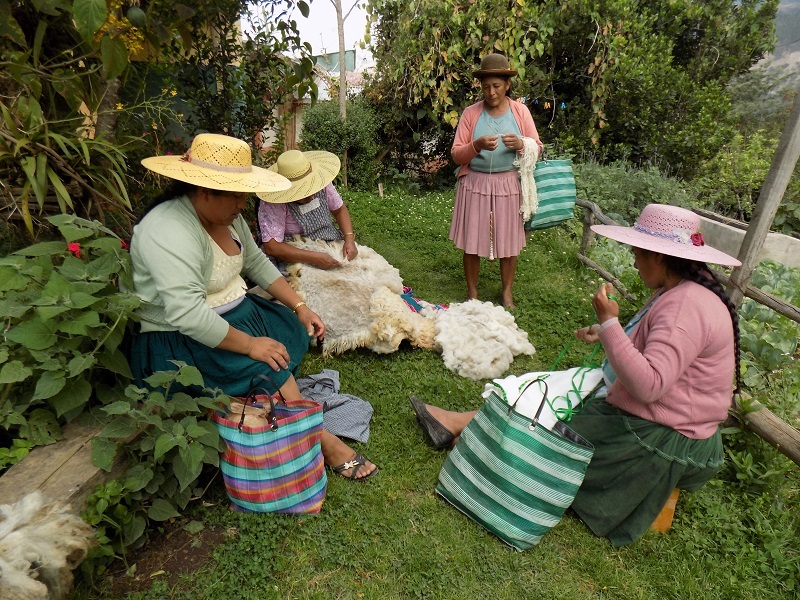 Doña Antonia decided that she needed to start over using a sheepskin instead of beginning the washing process with sheared fleece. 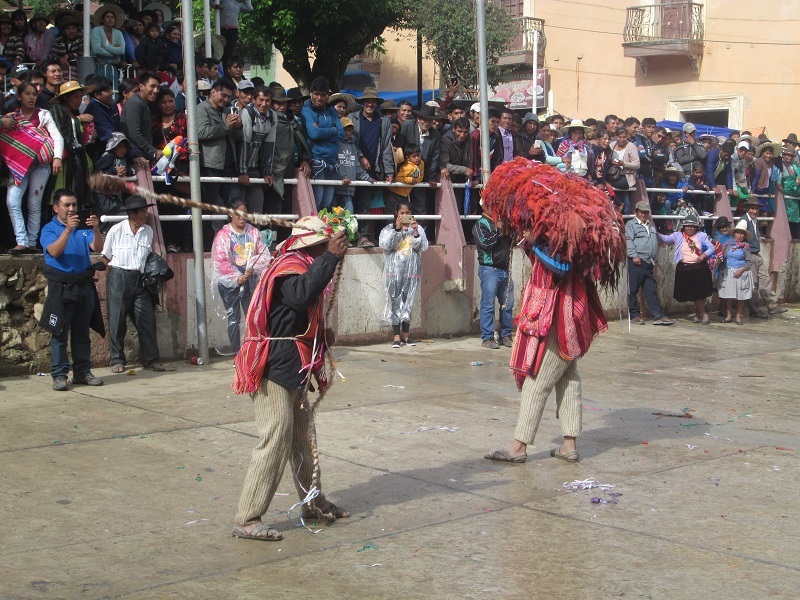 Doña Beatris, who is in charge of the 6 Spinzilla spinners from her community of Sanipaya, happened to be in town. 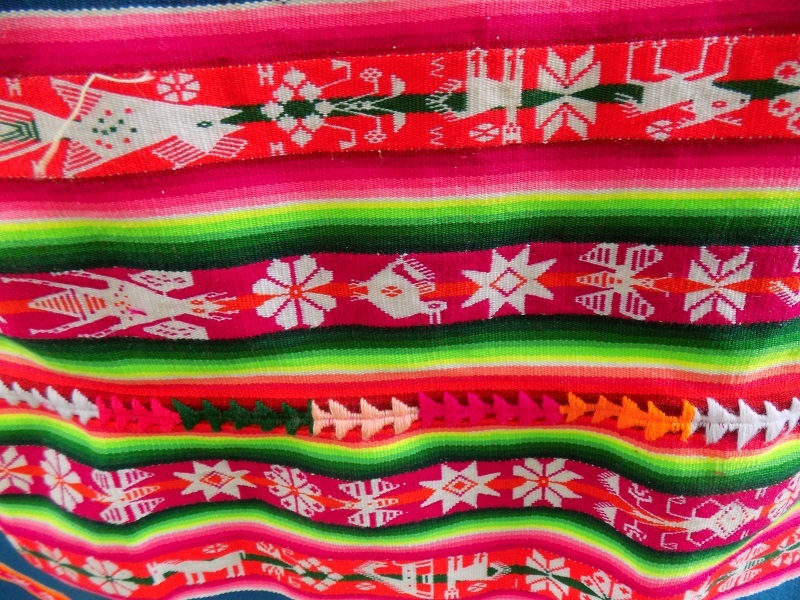 She was spending the Club day doing her son´s “home economics” project of making a table cloth by pulling threads in a length of cloth and weaving in a bright green ribbon. She said she had 2 sheepskins and offered to sell one to Doña Antonia after washing them the following day. 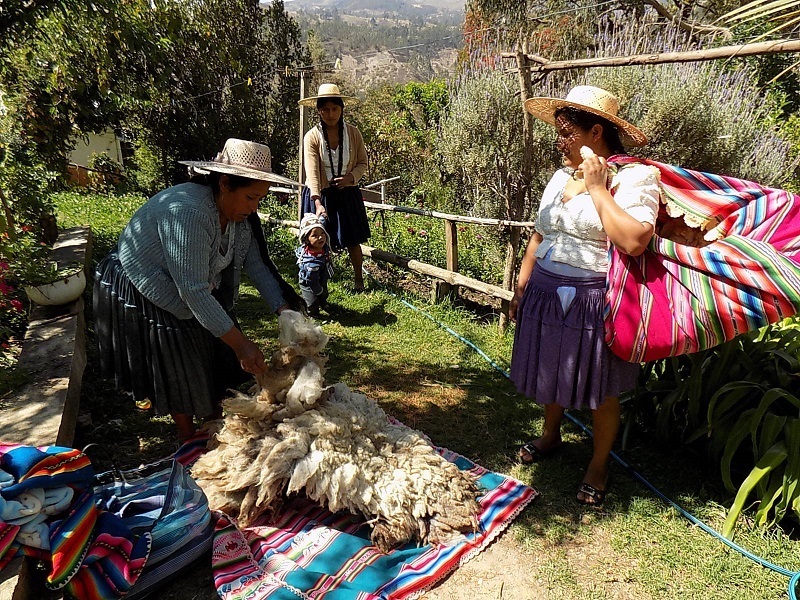 Unfortunately, a neighborhood dog snatched one of the washed sheepskins from where they were drying outdoors, so Doña Antonia was once again in search a sheepskin. The preparation for Spinzilla Spinning Week is a lot of work for the spinners, but it is work they’d be doing anyway. 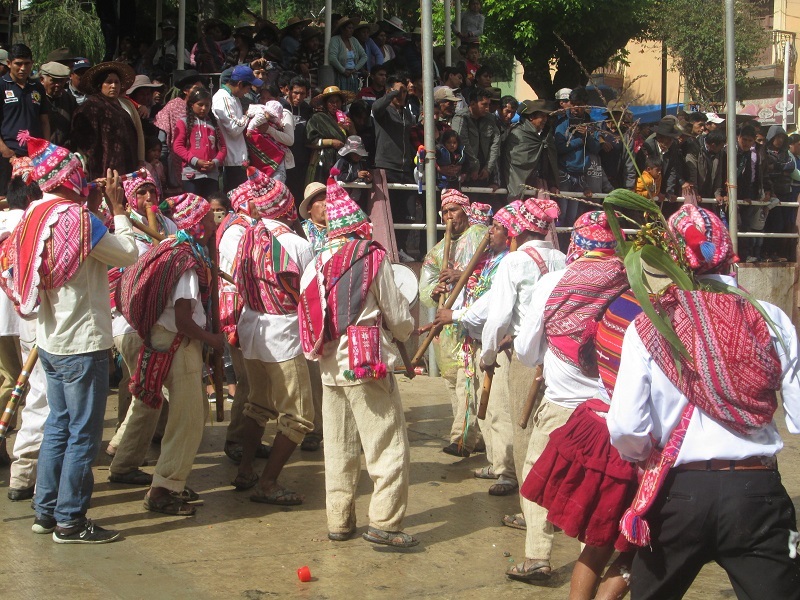 As an event, it recognizes their life long honed skills as spinners and weavers. It has created many learning opportunities for the 25 women, most of who attended few if any years of schooling. These 4 years of empowering experiences would have been impossible without your support. July is sign-up month for the Spinzilla Cloth Roads team Warmis Phuskadoras. Registration has grown over the years from scrambling to fill the 25 member team in 2014 to having a wait list of 5 spinners this year. Last year the invitation was extended for a foreign spinner to join the team, but there were no takers. It appears it was a one-time offer as now a foreigner would be on the waiting list. Those on the waiting list will pay the required 15 Bs. ($2.16) participant fee to sign up and will receive the same prize as the official participants. This year the prize is a store bought shawl, nobody opted for the offer of yarn to crochet a shawl of their own design. The waiting list was added so that everybody who was interested would be encouraged to participate. Adviana, a long time Club de Artesanas (CdA) member, wanted to sign up last year, but didn’t make her wishes known until after the registration deadline. Although her lifestyle in town does not lend itself to pasturing and spinning, she does weave to sell through PAZA. During the Club dye season she is always short of skeins to dye, so space had to be made for her to spin during Spinning Week. 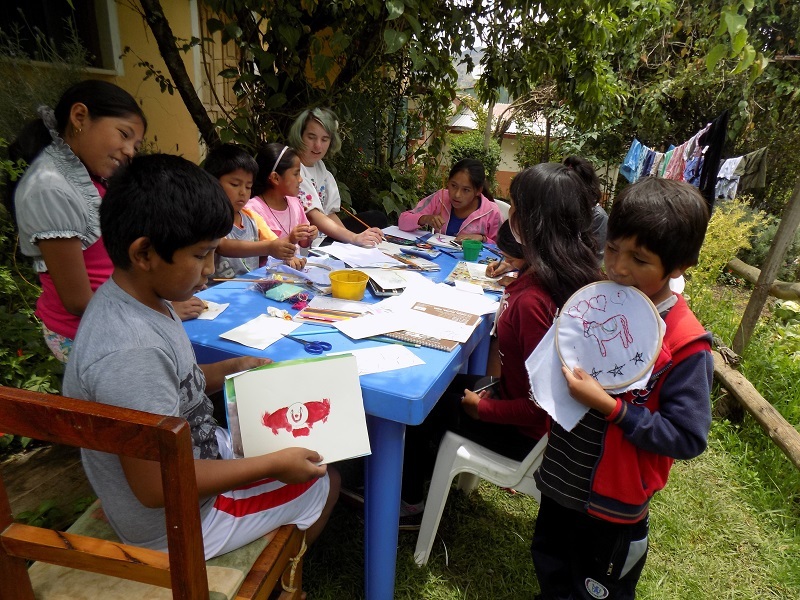 Maribel, the youngest member of the Centro de Artesanía, Huancarani (CAH) is also on the waitlist. It is worth recording how much and how well the 20-somethings spin this year to be able to measure their improvement over time. 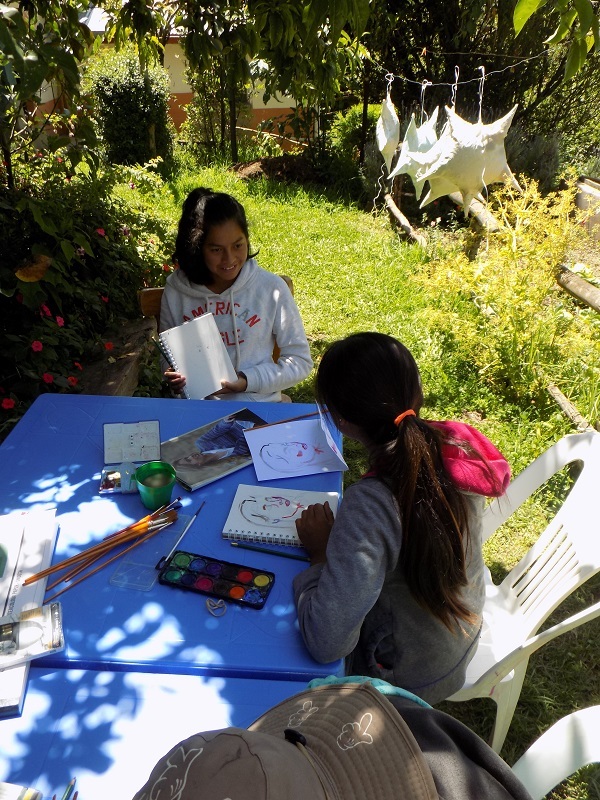 Another new spinner on the wait list this year is Florinda, who is about 17 years old and is physically handicapped for which there are no services in rural Bolivia. 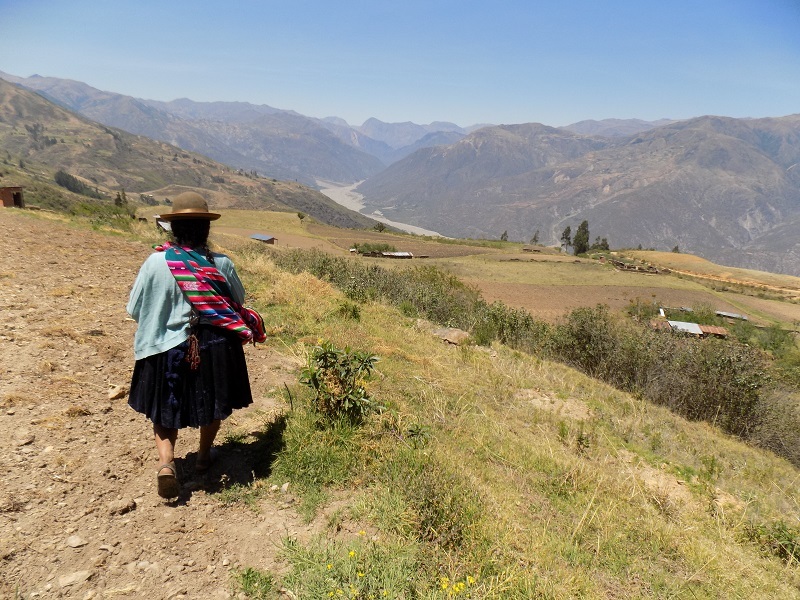 In 2009, it was brought to PAZA’s attention that a young girl in Huancarani who loved school was not going to be able to continue because she was getting too heavy for her parents to carry her from their home up the mountainside to the school. 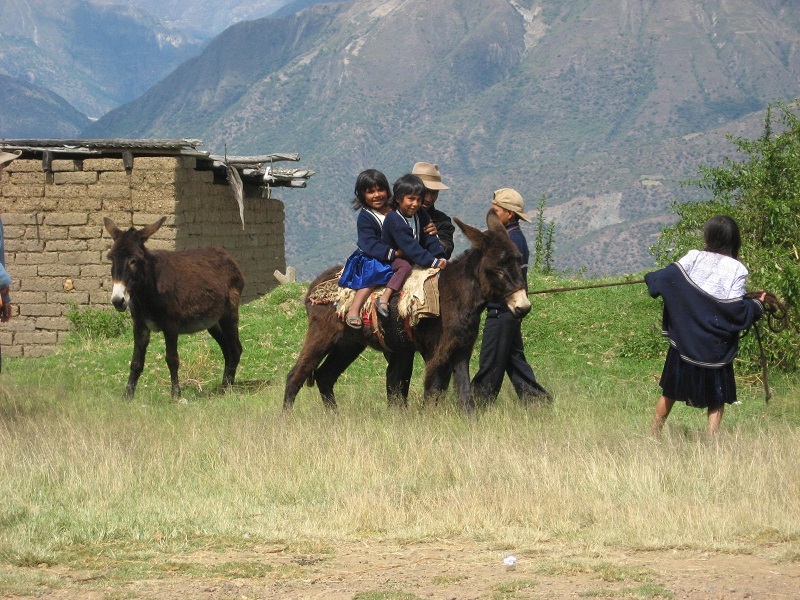 There were 2 visitors from Bozeman who met Florinda in Huancarani and bought the family a burro named Luisa. 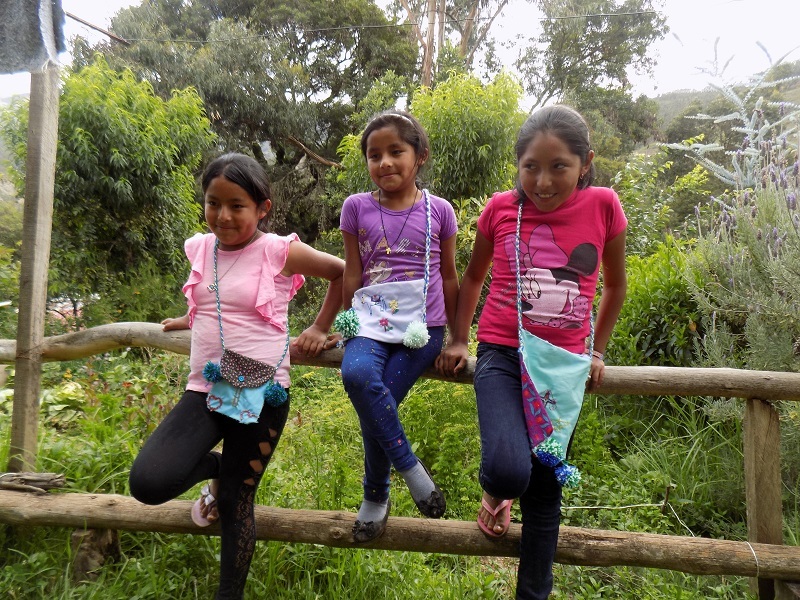 The family still has Luisa and Florinda continued her education repeating 5th grade not wanting school to end, but it did. 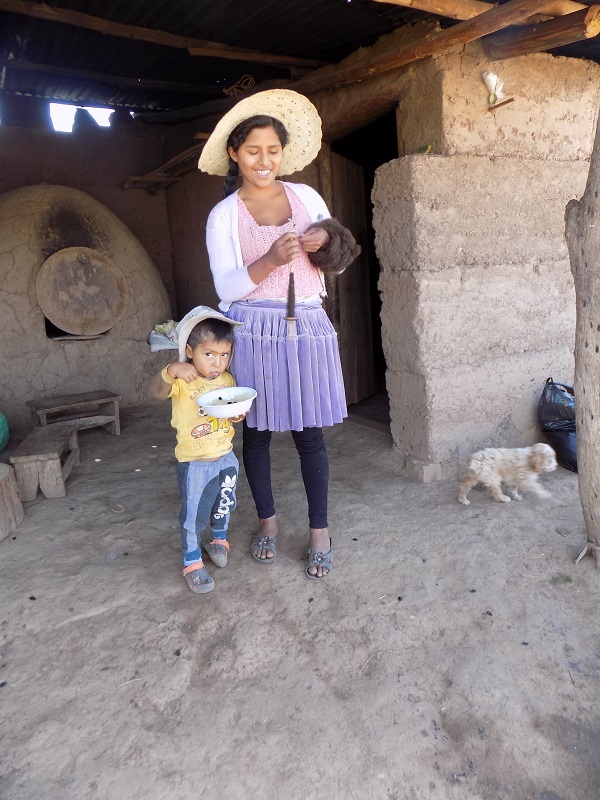 Florinda cannot stand or walk so is confined to the family home and grounds where she helps her family by throwing rocks to keep the birds out of the crops. 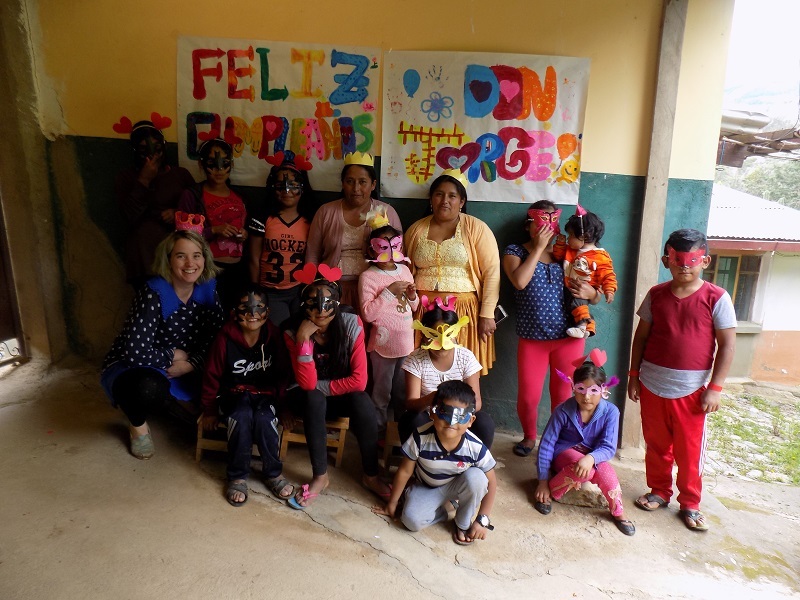 At the weavers’ meeting in Huancarani in early July, Florinda’s mother, who participates in Spinzilla, said that her daughter is the better spinner and wanted to join the Spinzilla team. Florinda was signed up, and PAZA paid her registration fee. 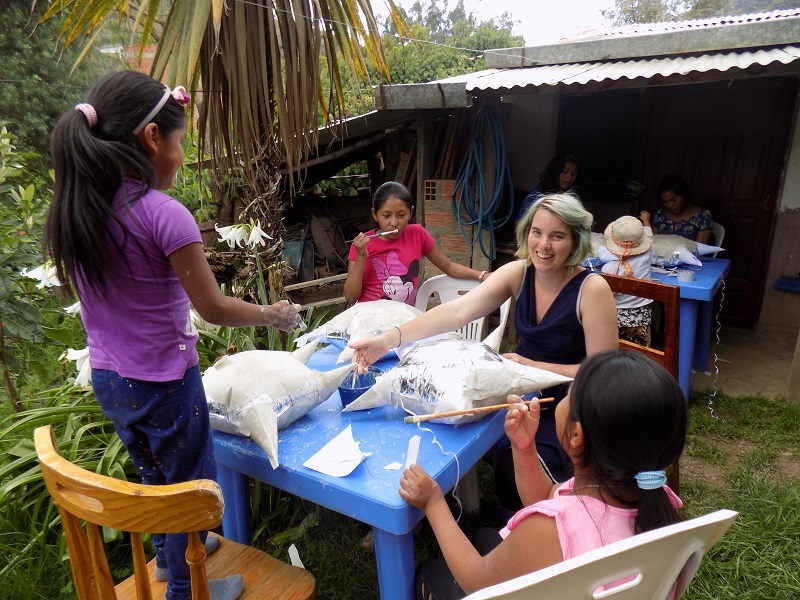 She is back on the PAZA radar, and the Club de Artesanas will make an outreach effort by offering her patterns and supplies for crochet and knitting projects. Did the founders of Spinzilla have any idea of how far reaching the competition would be? Doña Francisca is on the official Spinzilla roster for her first year competing. 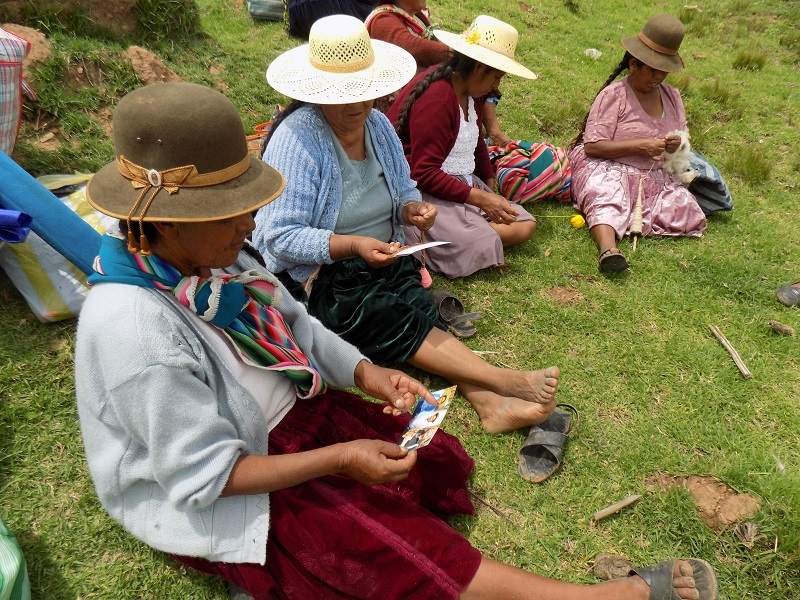 She has spent her life spinning and weaving, but for years has gone round and round with Doña Máxima for lack of attention to quality standards with her weavings. Last week, she finally presented a faja that met the quality standards, although she did not follow the color specifications of the order. PAZA bought the faja with the caution that the next time a weaving does not meet the order’s specs it cannot be purchased and will go into the store inventory. She smiled, nodded her assent, and was obviously happy to join the ranks of the weavers filling orders and participating in Spinning Week. She said she was already getting ready for the competition and had traded corn for a sheepskin of long white fleece to spin. It is time for the annual Spinzilla fundraiser which needs to be fully funded so that the ongoing PAZA activities are not impacted. Expenses not yet covered are estimated at $730. If you donate and are a Spinzilla spinner please include a note with the name of your team. 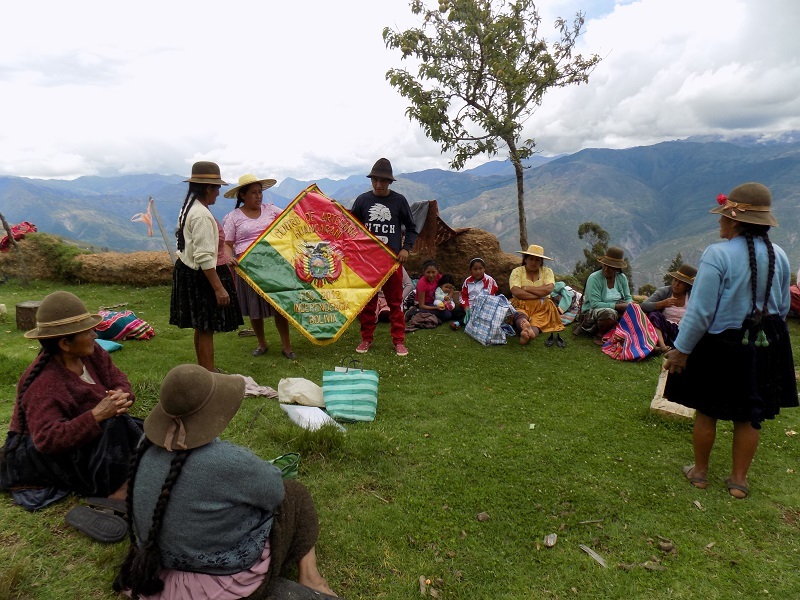 All comments and words of encouragement that accompany donations are passed on to the Bolivian team members. Thank you Lyn Lucas, Dorothy Thursby, and Myra Gilliam for kickstarting this year’s fundraising effort! Hugs!